On my father’s side my Scot Irish roots in West Virginia come from John McCoy (1750-1816) a weaver and his wife, Hesther (Easter, Esther) McCarty (c. 1757-1850.) While many Scot Irish emigrated to America in several waves from 1718 to the start of the Revolutionary War, this McCoy family came later. Possibly the first to come to America was an older son William McCoy/McKay, who came from Clogher in Tyrone County around 1801/1802, and lived for a while in Philadelphia where he married Catherine Kearns about 1803 before relocating to Lewistown in Mifflin County Pennsylvania. John and Esther McCoy and several of their children arrived in July 1802 in Wilmington, Delaware on the ship Mohawk having sailed from Londonderry in Tyrone Northern Ireland. John and Esther sailed with their children (including my g-g-grandfather Joseph McCoy junior, John McCoy, junior, Abraham, James, Jane, Sarah and Margaret.) John, James, Hesther, John, Sarah and Joseph McCoy traveled as a group with one chest and one bundle to hold all their worldly possessions. Some of the family went to the Shenandoah Valley. The two brothers John McCoy, junior and Joseph McCoy, junior moved for a while to Lewistown to join William McCoy who stayed in Lewistown for the rest of his life. Prior to 1808 the brothers John and Joseph McCoy crossed Pennsylvania and traveled to western Pennsylvania and Ohio County Virginia, from where they--on some kind of craft--floated down the Ohio River, settling on Middle Island Creek, the longest creek in the world not called a river. The creek is incredibly windy and sinuous as can be seen in the map. In 1808 John McCoy senior bought some farm land on “the loop” about two miles below Middlebourne. The small map shown, part of a large map under glass at the Tyler County Heritage and History Museum in Middlebourne, WV, shows some of the many loops in Middle Island Creek! Joseph McCoy, junior, son of John McCoy, was called junior because there was an older Joseph McCoy (possibly his Uncle) who lived in the area. 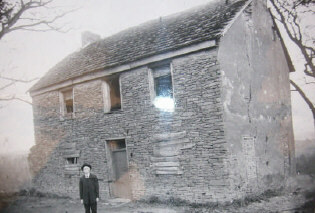 Joseph was born in Northern Ireland about 19 Feb 1786 and died in West Virginia in 1877. A farmer, Joseph lived with his father, who died in 1816. Joseph and his Uncle Joseph were executors of Joseph’s father’s Estate. Finally, twenty-two years after sailing to America in 1824 Joseph married at age 36 Jane Martin, daughter of Martha Bryson and Joseph Martin. 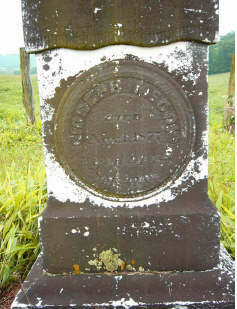 Tombstone of Joseph McCoy who died 1 Nov 1877, age 92. Digital photograph by Carol P. McCoyThe tombstones of Joseph McCoy and Jane Martin McCoy in Poly Archer Cemetery in Tyler county are the only public records of their deaths. This small cemetery is located in a distant field separate from the main cemetery which is next to the Poly Archer chapel not too far from Middlebourne. Many families were torn by the Civil War, especially those in W.V. Those who sympathized with the South were buried in the field cemetery, and those who sympathized with the North were buried next to the chapel. While there is no official death record for Joseph McCoy, I know exactly when he died because I have two letters written in pencil by Ralph Gorrell (a son in law of Joseph McCoy junior) to his brother in law--my great grandfather John William McCoy. These letters describe the illness and death of Joseph McCoy on the 1st of November in 1877. Apparently, Joseph, who outlived his wife by four years, was glad to meet his maker and died without a struggle or groan. The ancestors of Jane Martin came to Dover New Hampshire (N.H.) in the 1600s. Several Martins migrated to New Jersey (N.J.) John Martin was one of the founders of the town of Piscataway N.J. in 1666 (where Carol McCoy later went to graduate school at Rutgers). Descendants Joseph Martin and his father John Martin fought with New Jersey troops in the Revolutionary War. By the late 1700s the Martins migrated to Western Pennsylvania and then floated down the Ohio River to become early settlers of Ohio county Virginia (later called Tyler county West Virginia.) 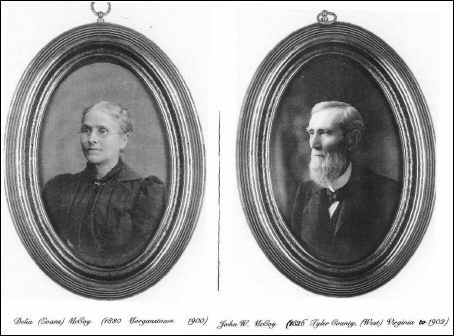 Joseph McCoy and Jane Martin’s children were all born in Tyler county WV. Their son, John William McCoy, my great-grandfather, was born in 1826. He worked on the family farm until he was about 21, then studied law with John Horner, and became a lawyer. Law was a smart profession given the confusion surrounding land boundaries and the frequent land disputes in court. In the course of his law practice, John W. McCoy, met his law partner’s sister-in-law, Delia Maria Evans who lived in Morgantown, Monongalia county, Virginia (later W.V.) Delia was the daughter of Rawley Evans, and grand-daughter of the Monongalia county pioneer settler, Colonel John Evans. They married in Morgantown in 1855. Rawley Evans, Delia’s father, and John W. McCoy posted bond for the wedding. John Evans, was the son of John Evans, whose family came from Wales to Philadelphia in the early 1700s. After his father died of a snake bite when he was a young lad, John Evans was raised by his mother in the area that became Fairfax Virginia. 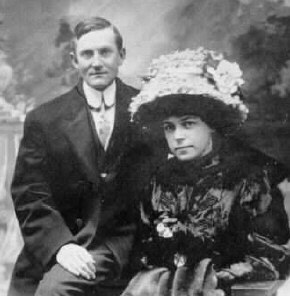 John Evans married Rebecca Ann Martin (not related to the other Martins) and began a family. After the Proclamation of 1763 forbid people from settling west of the Alleghenies, John Evans decided that that was the place to be. He and his wife, his mother, a tutor, some children and some slaves, traveled to Fort Cumberland, Maryland, where they waited out the Indian hostilities. In the late 1760s John Evans traveled down the Monongalia River and claimed a tomahawk right to some land in Augusta (later Monongalia county) Virginia below what would become Morgantown in 1785. John Evans was an early county clerk, served as the county lieutenant, defending the large border against the Indians and fought in Lord Dunmore’s War and the Revolutionary War. He lived into his nineties, finally receiving his Revolutionary War pension for the last two years of his life. John Evans and Rebecca Ann Martin raised a large family, which included a son Rawley Evans (for whom my father was named). Many people have joined the D.A.R through his service. Supposedly George Washington, when he was surveying the area, once slept in John Evans’ cabin, which is why it was preserved for such a long time. Having perused the journals of George Washington, I found no reference to such a visit, but it certainly seems likely. Supposedly the cabin was of particularly high quality. I like the photo below, which can be seen at the WV Regional Collection at the University of WV in Morgantown, WV. I have been fortunate to receive some of his letters and documents from the mid to late 1800s. Their son, Paul McCoy, obtained his law degree from West Virginia University in 1898. (I have his college year book from 1896. The photo of Paul McCoy in the glee club is from this year book.) Paul McCoy moved to New York City to make his fortune in the early 1900s and wed the lovely Irma Constance Pollak (Pollock) in 1909. He supposedly told Irma that he would marry her on their first date and she said "like hell you will." But as you can see, marry her he did.